Update: Coincidentally, the day after I published this, London-based software engineer Julius Sweetland published Optikey, which uses iris tracking to let users type and use their computer’s “mouse” hands free. This could be great for those people who don’t have good dexterity. Check out the Optikey wiki on Github. “The ideal payments experience would be an invisible one,” said a friend of mine while we were driving through the Tenderloin in San Francisco. We’d had a drink at a spot where to gain access you have to mention something about a library. Apart from the price (stratospheric, but passable because it was quite tasty, and in San Francisco) the process of cashing out was fraught with unnecessary friction which drew my attention. There was waiting for the bartender to print our tabs, still more waiting while he gathered our cards, or taking time to pay cash and get change, etc. In all, it took probably 4-5 minutes, a full 7% of our total time at the establishment. This post is an exploration of payments, virtual reality, and the use of biometric data to make payments in a virtual reality environment. Not so much a technical paper as a meandering survey of various technologies and their intersection, this post can be broken into three parts: first, an overview of the payments space and investor interest in financial technology; second, analyzing the current trends in virtual reality headset technology; and finally, I hope to lay out a couple plausible paths toward building a seamless payment experience in immersive VR based on current hardware trends and industry forecasts. Venture capitalists are putting lots of money into financial technology (“fintech”) startups. According to a report 1from consulting firm Accenture, venture capital investment in fintech startups tripled between 2013 and 2014, from $4.05B to $12.21B, an increase of 201%. Compare that to the 65%2 increase in overall venture capital invested over that same period of time, and it’s easy to see the optimism investors signal about companies looking to improve investing, fundraising, and payments. Across the range of online and in-real-life shopping experiences we encounter, the payment process is getting smoother for both the merchant and the customer. I’m too young to remember a time where manual credit card imprinters (a.k.a. “knuckle busters”) were still in use, but based on some Youtube videos I’ve watched about the setup process, these devices seem like a real pain to use. Then imagine being a merchant, keeping track of little slips of carbon paper and having to go through touch-tone phone processing for each transaction. It seems like a real nightmare, one I’m happy to have missed out on by the time I took a high-school job at a pizza place, where the bulk of transactions were credit or debit processed through a terminal. Compare that experience to Amazon, where I purchase things with 1-Click®. Or, a few years ago, a friend’s startup wanted to install RFID chips into hangtags at physical retail stores which, in conjunction with a motion tracking system, would bill customers for the goods they carried out of the store, allowing them to skip the traditional checkout process. And of course there is the next generation of chip-and-PIN cards, NFC payments through mobile phones, and other innovations which have been written about extensively. These technologies have made the payment experience more convenient and more secure than traditional methods of physical payment. People have been transacting in person since time immemorial, and we’ve progressed from bartering to coinage and paper to digital media. We’ve been transacting telephonically since the late 19th century, when the first wire transfers were exchanged. And modern online payments have been “a thing” since at least 1994, when NetMart launched in August.3 4 Later, the release of SSL v2.0 made it possible to encrypt financial information within the browser, saving consumers from downloading and configuring complicated software packages, which they had to do with NetMart. Virtual reality (VR) is a completely new frontier for payments. In a time when iris tracking is just starting to produce virtual reality experiences (almost) as rich as the world beyond the goggles, who is to say our irises – as unique as fingerprints – cannot be used as another biometric validator of identity? New gestures are being codified into our neuronal hardwiring in the form of everyday interaction between humans and computers – double click, conversational virtual personal assistance, pull to refresh, Force Touch, and so on – so who is to say that I can’t sign a check with my eyeball? Today, the ways everyday consumers can interact with virtual reality space are limited, but our capabilities are expanding. The Oculus Rift, which ships in Q1 of 20165 will come with an XBox One controller, a 3D sensor, and of course the headset. Oculus is also developing a pair of optically tracked controllers which will give users Minority Report-like hand-wavy control over their virtual environments. Pinch | Virtual Mall of the Future – Now from Cordon Media on Vimeo. It bears mentioning that this is just a rendering from Cordon Media, not a live product demonstration, but based on the keyboard and cursor-based interaction model, it seems like Pinć is taking one small step – rather than a giant leap – away from the status quo. The video does not show what the checkout and payment interface looks like, but I’m willing to bet it utilizes the virtual keyboard Pinć is building into their app platform. If I get to see a pair of jeans, a tent, or a stuffed toy for my cousin through a VR headset, it makes no sense for me to eject myself from virtual space to use my credit card. Nor does it make sense for me to resort to the most contemporary of physical payment methods: using the NFC chip on my phone (Because, if I’m in the Rift or a comparable immersive VR headset, I don’t want to have to blindly fumble around with my phone or physical credit cards to make a payment.) But at the same time, I want the same kind of seamless experience in VR as taking out my phone and paying with my fingerprint in “the real world”. I argue that the next few years will see the emergence of seamless payments interfaces for virtual reality devices which do not rely on external peripherals to mediate the user’s experience of the payments process. The virtual keyboard Pinć intends to implement is skeuomorphic8 but it, just like the page-turning animation in the iBooks app prior to iOS 7, might just be a stepping stone to an interaction paradigm unburdened by relics of the media the new thing replaces. By virtue of the fact that this wave of commercial VR is still in its infancy, the hardware platforms VR companies are developing are also in their infancy. There is an opportunity to use the direction of the eye as a cursor or mouse, which creates the opportunity to build novel gestures native to immersive VR interfaces. One of the most promising additions to VR headsets will be iris trackers. Fove9 has developed a VR headset which tracks the direction of the user’s gaze and the open or closed state of their eye. In a stunning (and touching) demonstration of the technology, the Fove team created an interface for a wheelchair-bound child, who also couldn’t use his hands, to play the piano. Iris tracking, I believe, is the future paradigm of VR interfaces. New behaviors, like double-blinking, maintaining focus on a target at the bottom of the interface to scroll down a menu or list, and many other interactions I can’t quite imagine will sit as comfortably in the VR designer’s toolkit as autocomplete11 or forms12 are to the people who design for flat screens. It’s by happy coincidence that the body parts we rely on most to interact with the outside world also have patterns unique to each person. Fingerprints have been used for all sorts of purposes, from identifying criminals, logging into computers,13 unlocking security doors and, yes, buying groceries or coffee through Apple Pay and other services. And like we’ve seen with Fove, iris tracking is slowly making its way into virtual reality platforms, but it’s not enough to track an iris, you have to scan it. Iris scanning technology is slowly making its way into mobile phones and manufacturers are actively touting iris scanners as a security mechanism for mobile payments. 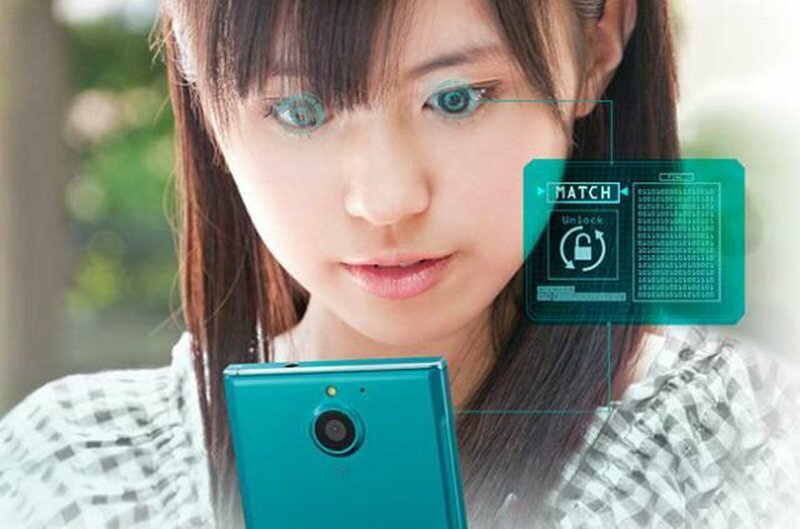 Japanese electronics giant Fujitsu was the first, in June 2015, to integrate an iris scanner into a mobile phone with release of the Arrows NX F-040.14 There are rumblings that Microsoft will be integrating iris scanners into the next generation of flagship Lumia smartphones.15 Although the iris scanners in the Lumia phones are ostensibly for user authentication through Windows Hello, banking consultant Fiasal Kahn discovered16 that Microsoft filed papers to become a “money transmitter”, which would place Microsoft on even regulatory footing with Apple, Google, Paypal and other payments providers. It’s quite likely that the first VR applications to use iris scanning as a means of user authentication (for payments or otherwise) will be on mobile phones integrated into a headset, like Pinć, the Oculus Gear VR headset, or even Google Cardboard. Figuring that the first set of consumer-ready VR headsets will not be hitting the market until the holiday season of this year, it’s unlikely that we’ll see native iris scanning technology in VR headsets for a couple of years… assuming of course that VR finds retail success this year. However, for VR to be commercially viable long-term, manufacturers of dedicated VR devices (e.g. devices which aren’t based on mobile phones) will need to build in functionality which benefits both the user (in the form of a smoother experience) and the people building out the virtual world. Paying for things with the blink of an eye might be the thing which makes this generation of VR less a passing wave and more of a rising tide. Jalali, Ali A., and Hamid Mahmoodi. Virtual Age: Next Wave of Change in Society. Rep. International Joint Conferences on E-CASE and E-Technology, 8 Jan. 2009. Web. <http://online.sfsu.edu/mahmoodi/papers/paper_C50.pdf>. Skan, Julian, James Dickerson, and Samad Masood. The Future of Fintech and Banking: Digitally Disrupted or Reimagined? Issue brief. Accenture, 2015. Web. <http://www.fintechinnovationlablondon.net/media/730274/Accenture-The-Future-of-Fintech-and-Banking-digitallydisrupted-or-reima-.pdf>. Gilbert, Alorie. “E-commerce Turns 10 – CNET.” CNET. N.p., 10 Aug. 2004. Web. <http://www.cnet.com/news/e-commerce-turns-10/>. “First Look at the Rift, Shipping Q1 2016.” Web log post. Blog. Oculus VR, 6 May 2015. Web. <https://www.oculus.com/en-us/blog/first-look-at-the-rift-shipping-q1-2016/>. Hello Pinć. Pinć, n.d. Web. <http://hellopinc.com/>. “Gear VR.” Oculus VR, n.d. Web. <https://www.oculus.com/en-us/gear-vr/>. “A skeuomorph is “a derivative object that retains ornamental design cues to a structure that was necessary in the original”, Greif, Sacha. “What Skeuomorphism Is and Isn’t.” SachaGrief.com. N.p., 12 Sept. 2012. Web. <http://sachagreif.com/what-skeuomorphism-is-and-isnt/>. “The World’s First Eye Tracking Virtual Reality Headset.” Fove, n.d. Web. <http://www.getfove.com/>. “Eye Play the Piano.” Eye Play the Piano. N.p., n.d. Web. <http://eyeplaythepiano.com/>. Van Welie, Martijn. “Autocomplete.” – Interaction Design Pattern Library. N.p., n.d. Web. <http://www.welie.com/patterns/showPattern.php?patternID=autocomplete>. Van Welie, Martijn. “Forms.” – Interaction Design Pattern Library. N.p., n.d. Web. <http://www.welie.com/patterns/showPattern.php?patternID=forms>. Germain, Jack M. “IBM Introducing Fingerprint Reader into Laptop.” Web log post. IBM Introducing Fingerprint Reader into Laptop. Tech News World, 4 Oct. 2004. Web. <http://www.technewsworld.com/story/37017.html>. IBM was the first computer manufacturer to include a built-in fingerprint scanner when it released the ThinkPad T42. Rubino, Daniel. ‘Microsoft’s Cityman And Talkman Flagship Lumia Phones And What You Need To Know’. Windows Central. N. p., 23 July 2015. Web. Khan, Faisal. ‘Microsoft Forays Into The World Of Payments. Gets Their 1St Money Transmitter License – Faisal Khan’. Faisal Khan. N. p., 30 March 2015. Web.